In my previous post, I wrote about cross number puzzles—puzzles that mix arithmetic and logic to introduce students to place value, commutativity, and the addition and subtraction algorithms. Now, I’d like to present a variant of cross number puzzles that adds some algebra to the mix. Below (and here on its own page) are a collection of algebra cross number puzzles. 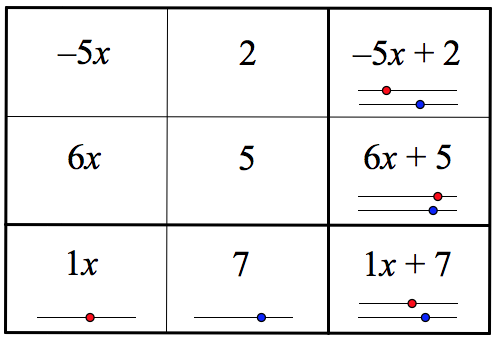 Students enter expressions into the empty cells by dragging the red and blue slider points. Below is the solution to the first puzzle. Notice that –5x + 2 and 6x + 5 are each the sum of the two cells to their left. And 1x and 7 are each the sum of the two cells above them. Finally, 1x + 7 is the sum of –5x, 2, 6x, and 5. To move from page to page of the websketch above, use the arrows in the lower-right corner. Each page features puzzles with different missing elements of the grid. We haven’t pursued cross number puzzles beyond this algebra-themed variation, but what other versions might you create? How about, for example, a cross number puzzle that features imaginary numbers?